This was supposed to be her World Cup. Jordan Nobbs has won 53 caps, been named England player of the year and lifted 11 trophies with Arsenal. But she found herself on the fringes of England's third-place finish in 2015, when a torn hamstring badly affected her preparation for the tournament. This was going to be different. Her time. Instead, she has been cheated out of it again after rupturing her anterior cruciate ligament in November. Speaking to Nobbs at Sky Studios, she is well into her rehabilitation - what she calls "the really boring part" - and has everything mapped out from here. The first task was to begin walking properly again. The next challenge was getting back on the bike. The focus for now is on straightforward strength work as the load on the knee is slowly increased. She is just beginning the anti-gravity jogging and the squats have started already. Next it will be jumps and hops, sprint mechanics and eventually the sort of side-to-side movement that will really test her recovery. She will get there. "Little milestones," Nobbs tells Sky Sports. But this is a mental challenge as much as a physical one. And dealing with that can be even more difficult than anything that an elite athlete has to face in the gym or on the pitch. Everyone has been supportive. Of course they have. Nobbs is grateful to the fans for their kind messages, her family, friends and colleagues too. Arsenal team-mate Danielle Carter suffered the same injury in May and has provided support. England manager Phil Neville sent her a giant Lego set to help pass the time and she is looking forward to doing that. Ultimately though, Nobbs, the quintessential team player, must do this alone. Every day is different. "Sometimes I can't wait for the girls to go out on the training ground and leave me in the gym," she says. At other times, the loneliness of the path she is on kicks in. "The other day we had four of our injured players go back out on the pitch," she adds. "So it went from there being five of us together in the gym to just… emptiness." Nobbs left her home in the North East as a 17-year-old to pursue her dream in the Women's Super League with Arsenal. Now 26, there have been few regrets about the move, her commitment to this career never in doubt. But robbed of the regular highs on the pitch, doing her rehabilitation far away from those loved ones she has left behind is not so easy. "That's the hardest part," she explains. "Coming home from five hours in the gym and not having a home-cooked meal from your mam or your dad. Just that feeling of going for a coffee. You never take those things for granted but when you are injured and you have lost that excitement from football you want those loving people around you. "You just have to stay as positive as you can but that's something I've found hard because I can't go home. I need to carry on with my rehab. But I am an elite athlete and I have put everything from the time I was seven years old into football. I have made those sacrifices. "You have to accept injury along the way but I think you also have to accept that you are allowed to be sad about it and that you are allowed to be a bit emotional at times and know that it hurts because that's how passionate I am about the game." There is a cruelty to how much Nobbs adores the game that she cannot currently play. "My world revolves around football," she says. Her father Keith played for Hartlepool and their phone conversations tend to follow a similar pattern as a result. "He is a football talker so sometimes I am like, Dad, just stop talking about football." Switching off isn't easy. "I am trying to find that balance but now rehab is my world it is hard not to talk about my knee a lot. I think I would be angry if nobody asked me how my knee is or how my rehab is going but when they do ask me you go into this repeat process of having the same conversation. It's about accepting the injury but also accepting that people care." Nobbs is well aware that the next mental test is not far away now. After the Lionesses recent success in winning the SheBelieves Cup, the buzz about this summer's World Cup is growing. Women's football, and its players, will likely never have known anything like it. But this midfielder, in the prime of her career, will find herself on the periphery of it all. Nobbs is still determined to contribute any way she can. "I have enjoyed watching," she insists. "I like to know what's gone on and feel a part of all that. I like to be able to talk to the girls when they remember something that happened in a game. 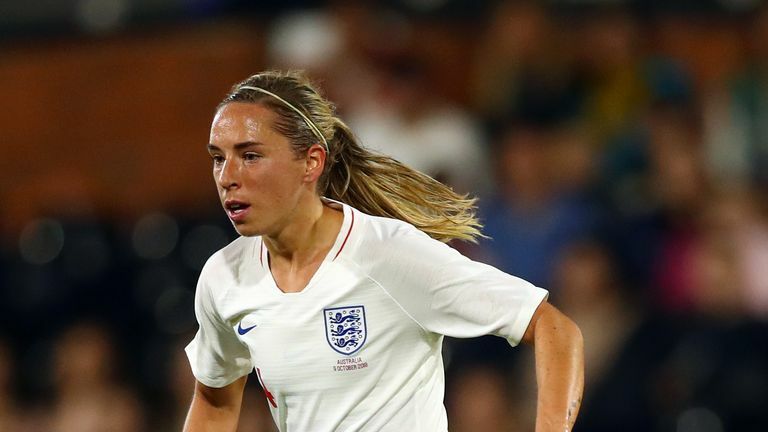 So I am going to camp with the England girls for my rehab and just have food with them because I want to make sure I am behind them in every game they play." She adds: "It's tough at times mentally but I just want to stay involved. I want to be someone who made a difference."